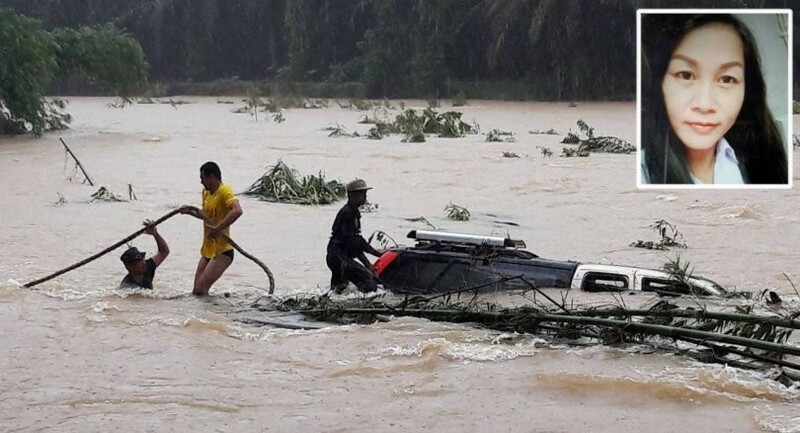 The Thaiger reported about a woman who went missing on Saturday night amongst the torrential rain when the pick-up truck she was in got caught in a flash flood. Sadly, she was found dead. Searchers have recovered the body of the Ranong woman who was a passenger in a pickup truck that had been swept into a canal. The four-day search ended with the discovery of the body of 39 year old Nokkaew Namsantiah submerged beneath tree branches and other debris. The location was not far from the accident scene near the Wang Phak Bung Bridge in Tambon Naga, Suk Samran district. Sutas Kaewpradit, head of Moo 5 village, said Nokkaew’s husband, 49 year old Samart Namsantiah, had been driving the truck and managed to free himself. The pickup was swept 600 metres downstream, where it was found empty on Sunday. On Monday night a flash flood affected 250 homes and vast areas of farmland in 11 villages in Tambon Pak Chan, Kra Buri district.